Gestalt theories are part of the tools behavioural experts use to predict the response of a user’s visual system to a computer screen. We saw,in previous posts, the principle of proximity and the principle of similarity. 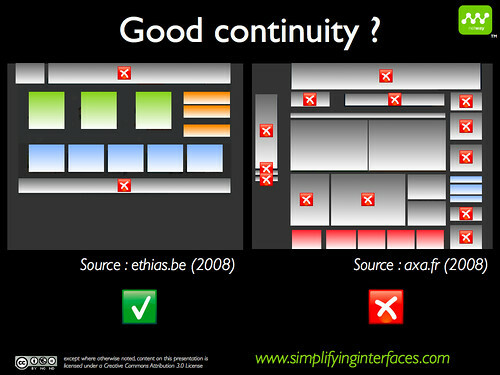 Let’s now have a look at the third of seven principles in all: good continuity. We prefer to perceive continuous forms as to their shape, their size and their placement. We prefer patterns to abrupt changes. 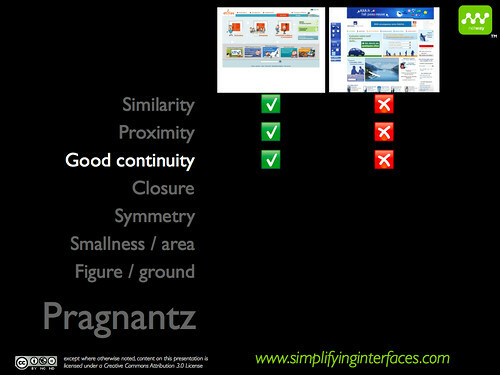 A good continuity allows the brain not to visit all the zones of a screen, once it has discovered a pattern. If the pattern is visible in the peripheral vision, our brain will easily attribute one meaning to a group of objects and determine topographical data. This Gestalt principle is closely linked to the first two principles and allows us to create a strong Netway Neuro-Visual Landscape™. On the Ethias site, we see that the green objects all have the same shape, the same size and that they are separated by identical spaces. This shape, size and space is only used in one place. The eye-tracking data our experts have been gathering for 8 years makes the behaviour that is determined by a pattern the brain has detected, an objective source of data. Let’s take the example of Ethias. The first green square will lead to longer and more ocular fixations; the second will have fewer fixations; and the third will have virtually none. Behavioural data has also revealed that one needs at least 3 elements for a pattern to emerge. Only then, there will be good continuity. 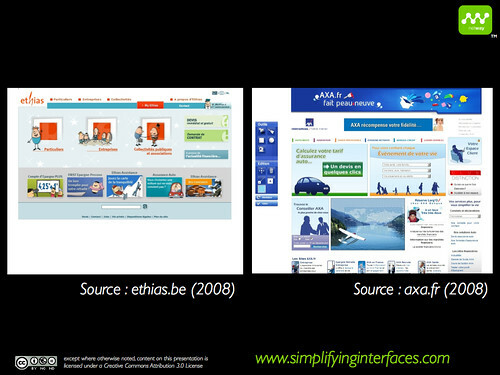 I have applied this principle when I have created the Ethias site, in order to generate the visual pathways I wanted. This behaviour is generated when the screen is visited the first time, when the Netway Neuro-Visual Landscape™ is under construction. Once the brain has determined a pattern, it will no longer attribute a meaning to each and every object that is part of the same pattern. In the AXA screen, this principle has not really been used. We need to analyse all the graphical elements in order to determine their meaning. This is contrary to our findings in the article on the Netway Neuro-Visual Landscape™, stating most graphical elements that respect the principle of good continuity are not visible in peripheral vision. This Gestalt principle is dear to good designers who defend light screens that leave enough space between the different graphical elements. By calibrating this space, and by using identical shapes and sizes, the principle of good continuity will have its effect. I’m really enjoying this series. Gaining an understanding of design rationale from a scientific method is extremely useful when dealing with planning visual interaction. We should all look at web design the same way that we look at industrial and product design–as simply another way humans interface with the tangible world. They eyes are as important a sense as touch. Too often web design is overlooked as a feel-good sales tool when in reality it’s often PART of the product. I wonder however, if it would be more useful to compare websites, as you have, with more similar goals/products/services, etc. as a better way of looking as solving usability problems. Apples to apples as we say here in the States. Looking forward to more on the subject.